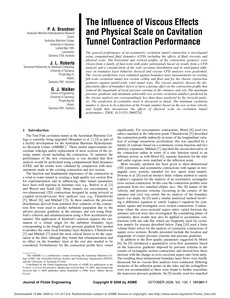 The general performance of an asymmetric cavitation tunnel contraction is investigated using computational fluid dynamics (CFD) including the effects of fluid viscosity and physical scale. The horizontal and vertical profiles of the contraction geometry were chosen from a family of four-term sixth-order polynomials based on results from a CFD analysis and a consideration of the wall curvature distribution and its anticipated influence on boundary layer behavior. Inviscid and viscous CFD analyses were performed. The viscous predictions were validated against boundary layer measurements on existing full-scale cavitation tunnel test section ceiling and floor and for the chosen contraction geometry against model-scale wind tunnel tests. The viscous analysis showed the displacement effect of boundary layers to have a fairing effect on the contraction profile that reduced the magnitude of local pressure extrema at the entrance and exit. The maximum pressure gradients and minimum achievable test section cavitation numbers predicted by the viscous analysis are correspondingly less than those predicted by the inviscid analysis. The prediction of cavitation onset is discussed in detail. The minimum cavitation number is shown to be a function of the Froude number based on the test section velocity and height that incorporate the effects of physical scale on cavitation tunnel performance.